One of the smallest American Viticultural Areas (AVA) in the U.S. is designated the Rocks District of Milton-Freewater. It lies in Oregon, just south of Walla Walla. The borders are so close and ill-defined that both states have a serious problem establishing who owns what. Even the local post office has a hard time locating official boundaries. It’s a hard, backwoods valley characterized by rustic country living, but of late it’s also become a region producing some of the nation’s most sought-after wines. These unique wines have proved to possess world-wide appeal. The Wine Spectator’s Harvey Steinman has described the emergent Rocks District as possibly one the most exciting areas in American viticulture today. These “wines of the wilderness” certainly reflect their ultra-wild surroundings, being big, brawny, and unabashed. It’s worth noting that "The Rocks” is one of the only wine regions in the world unaffected by pests. The protection afforded by the surrounding hills, sandy soils, and cold winters is highly effective. The Rocks has the only Vitus VIN vines in the U.S. growing naturally on their own root stocks. For a European like myself, this seems incredible. The Rocks vineyards do not resemble the usual uniform, slightly rolling hills such as those of the Bordeaux vineyards, but rather reflect the provincial rugged rock, stone, and scrubby vineyards more commonly found in rustic southern France or on the steep slopes of Northern Spain. The best vineyards in The Rocks are those situated on old fruit orchards containing the large “galets” that insulate the vines against night time frost and cold. The Rocks District valley was created at the end of the last Ice Age after the huge Missoula Flood. This created a terrain of heavy material in the middle of a river basin comprising the “galets”, smaller rocks, and tons of clay that produce the rugged, mineral, very aromatic wines with tertiary flavors. Meanwhile, from the sandier slopes of the river bank, wines with highly elegant aromas and finer tastes are produced. My wife, Julie, and I had the chance to visit the heart of the Rocks District, courtesy of Delmas Winery, a family estate founded there in 2007. The winery had focused solely on producing one Estate Syrah wine from their uniquely intense juice, resulting in just 340 cases of world class Syrah. The small quantities sold immediately on allocation. We met Brooke Delmas Robertson, the only daughter of the Robertson family, which, in an old French tradition, have handed down the Delmas name from one daughter to the next as a middle name. 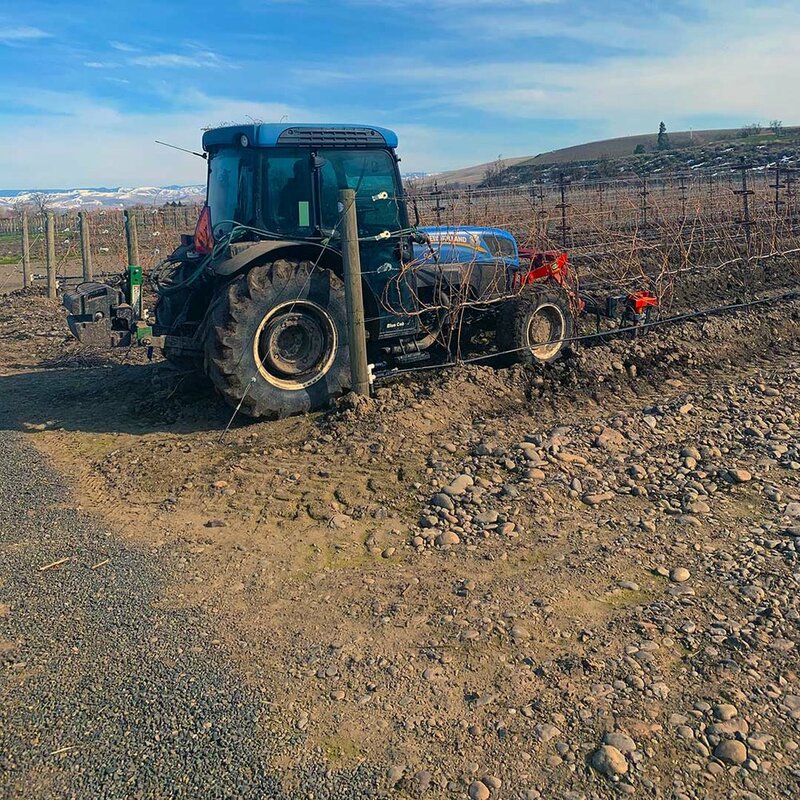 On a sunny morning at the SJR Vineyard (named for General Manager Stephen J. Robertson), not long after the winter snow had finally melted, she was directing the operation of 10 men. The Delmas vineyards are located at the end of the so-called river on silt banks and result in a wine with a very “fine”, suave texture. The tiny vineyard produces a minuscule 2 ½ tons per acre of Syrah with a small percentage of the white Viognier grapes added to the blend. The co-fermentation of both grapes gives the wine a complex, slightly floral edge. While the property sells SJR fruit to big hitters, such as Force Majeure and Gramercy Cellars, both of whom produce extremely dense, powerful, tannic wines, in contrast Brooke says her wines are “almost Pinot Noir in style,” highlighting the supple, sensual quality of Delmas winemaking. We were very grateful for our introduction to Delmas winemaking in general and in particular for Brooke’s helpful account of the Robertson family history. Nick Wise was born in NYC in 1969 and moved with his family to the UK when he was two. After graduating from Tufts University, he began writing books on popular culture and earned a bachelors in wine at the Wine and Spirit Education Trust in London, all the while working with various historic English wine and spirit companies including John Armit and Fuller, Smith and Turner. He is the author of four books on wine and a contributor to Decanter and Wine Magazine. Read his blog at wiseonwine.com. Follow Nick and his wife, Julie, on Instagram at @wiseonwine.